Behind the brick walls of the Mycetoma Research Centre trying to unravel the mysteries of the infection is a rare story of medical success in impoverished Sudan. With bandages on their swollen, deformed feet, patients from across the vast country arrive at the spotless facility set in a garden in the southern Khartoum district of Soba. 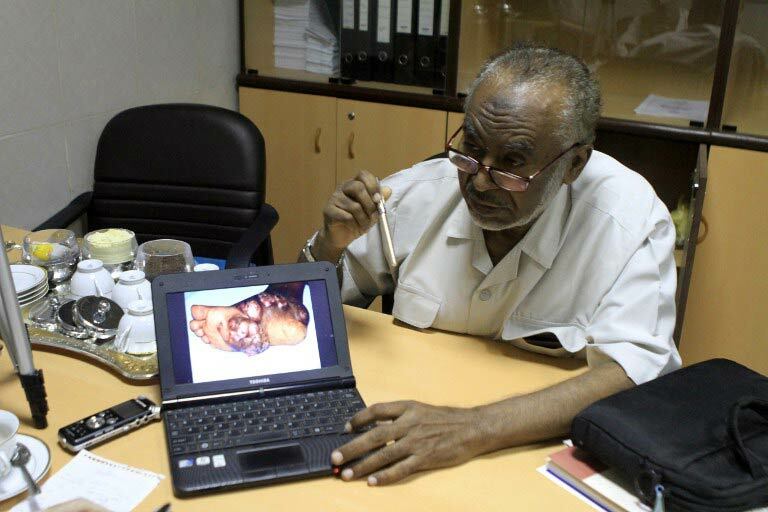 For more than 40 years, British-educated researcher Elsheikh Mahgoub has been searching for answers to the mysteries of mycetoma, a bacterial and fungal infection which can spread throughout the body resulting in gross deformity and even death. Sudan is particularly affected by mycetoma, which is also endemic in a geographic belt including regional neighbours Chad, Niger, Nigeria, Ethiopia, Somalia, parts of Saudi Arabia and Yemen, experts say. The belt also stretches to India and parts of Latin America. Mycetoma is “a badly neglected disease”, the United Nations’ World Health Organisation (WHO) says on its website. Yet in Sudan, researchers have been studying the condition since British colonial times, and the Khartoum centre has been globally recognised for its work. Such acknowledgement in the health field is unusual for a country which ranks near the bottom of a UN human development index measuring income, health and education. Mycetoma is characterised by swelling of the feet but it can eat away bone and spread throughout the body, causing grotesque barnacle-like growths, club-like hands and bulging eyes. 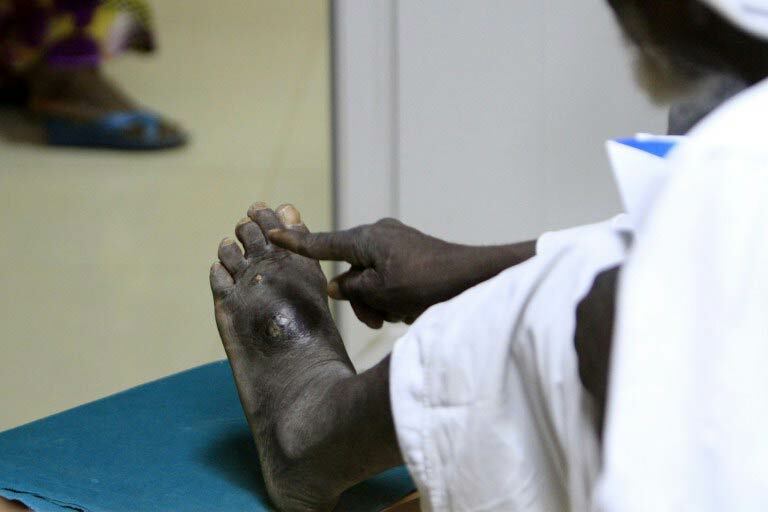 The traditional treatment was amputation – something the Sudanese centre tries to avoid. “Most patients who get it are farmers, or animal herders, and these are poor people,” says Mahgoub (78). Mahgoub says he established Sudan’s first mycetoma centre in 1968, working with a British nurse and a British technician. “Many people thought: Why should I be concerned about this disease which is not common, which is difficult to diagnose, and difficult to treat?” he told reporters on a tour of the facility, which opened at its current location in the 1990s. The centre offers diagnosis, treatment, training and research as part of Soba University Hospital under the University of Khartoum, which funds it along with some donors. It has its own laboratory, two wards, and is served by seven part-time doctors as well as Mahgoub, the research supervisor, and its director A.H. Fahal, a professor of surgery. Though its resources are limited, they have been used effectively, Fahal has written. Patients come and go – with 6 400 registered so far – but Fahal remains and so does Mahgoub, challenged by the puzzle of why mycetoma is so prevalent in Sudan and neighbouring countries. “I think there’s two things,” Mahgoub explains, pointing first to the organism’s presence in soil. He says people who make their living from the land are more likely to get pricked by thorns, for example, from the Acacia trees which are widespread in the mycetoma-prone region and provide a route for infection. Secondly, the patients have been found with weakened immune systems. Some not only have mycetoma but also Aids, leprosy, tuberculosis or other conditions, Mahgoub says. He does not yet have the answers. Mohammed al-Amien Ahmad is a typical case. The farmer tells Mahgoub that a thorn jabbed him about 20 years ago. “This thorn came out and it seemed to be OK. Later on the swelling came up. It was a bit itchy,” says the goateed farmer, who is in his 60s and wears a traditional white jalabiya robe. Ahmad, his enlarged left foot oozing pus, has travelled more than 500 kilometres by bus from Umm Rawaba where he farms about 70 acres of sorghum. His condition worsened over the past two years, he says, forcing him to reduce the amount of land he can work, and cutting into his annual income of 30 000 – 40 000 Sudanese pounds ($4 300 – $5 700). In a majority of cases mycetoma is painless, meaning patients like Ahmad delay seeking medical care. This makes treatment more difficult, Mahgoub says. “The main thing we tell them is to come early… Because if the swelling is small it can be excised in total,” with follow-up medication, he says. The Mycetoma Research Centre provides diagnosis and any surgery patients may need for free. But patients may require months of anti-fungal medication, which they must buy themselves. Some who cannot bear the financial burden stop taking their medicine, Mahgoub says. “In that case the disease will just go back to where it started. That’s a real problem,” he says. Drug prices in Sudan have climbed over the past two years as Sudan’s currency plunged in value and inflation soared. Sudan’s health ministry has expressed concern about the emigration of doctors and other health professionals seeking better salaries and working conditions abroad. Nationwide, there were 1.3 health workers per 1 000 people in 2011, against the WHO benchmark of 2.3. Many primary health care facilities in Sudan “lack appropriate medical equipment and supplies, have inadequate infrastructure or are understaffed,” the United Nations said this year. In contrast, the Mycetoma Research Centre “is recognised globally as a world leader”, an informal group of experts on the disease wrote after their first meeting this year in Geneva. There’s nothing like Ramadan in Sudan. To be more specific, from my personal experience, there’s nothing like Ramadan in my hometown of Khartoum. This year marks my second Ramadan away from home and, like they say, you never really realise what you had until it’s gone. There are so many things that I miss, but I mostly miss the sense of solidarity that binds the people of my country during such a month. I used to spend many hours of my fasting days in the streets of Khartoum. There is something majestic about how people carried themselves around; walking around the various streets, markets and bus stations, going about their daily business while bearing the grunt of the staggering heat of Sudan’s sun, trying to eke out a living in today’s harsh conditions. It is not the lanterns and well-lit streets and alleys that make Ramadan so special, rather it is the scope of distinct practices and traditions that are ever so unique. It is the call for Maghreb prayer and the events that follow. It is the people gathering around the mosques minutes before the sun sets, some worshipping in silence while others converse about their families, the weather and politics. It is that first sip of cool water that quenches the thirst of a hardworking bus driver who spends his entire day driving a rundown vehicle with no air conditioning, and suffers blasts of hot air coming from a broken window. It is that group of volunteers who stop you in the middle of the road at the sound of the azaan (call to prayer) to offer you water and dates to break your fast. It is family. My grandmother, may she rest in peace, would light up at the sight of my sisters, mother and I entering her warm home just in time for Iftar (breaking of the fast). She would kiss each one of us and ask Allah to protect us. It is her blessings, her smile and the wisdom in her eyes. It is tasting the food made with love; the aseeda (porridge), mulaah (sauce) and delicious soup just before we set off for prayer and later on commence our first meal of the day. It is the sugary gongolez juice, helo mur (a drink made with sorghum and spices) and hibiscus poured into enormous glasses. It is the long Taraweeh prayers that I used to always struggle with on the first week of the month after stuffing my face like it’s the last day on earth. So no, it is not the lanterns and well-lit streets and alleys that make Ramadan what it is in a place like Sudan, a place that lacks the kinds of festivities that other neighbouring countries have the privilege of exercising. It is the kind of love that is portrayed in the simplest of conduct, and in the crudest of times. It is the tie that binds. Maha El-Sonasi for 500 Words Magazine, an independent online magazine about Sudan. It is an amalgamation of various thoughts and opinions on Sudanese society, culture and life, and provides a platform for discussion among Sudanese youth. Connect with 500 Words Magazine on Twitter and Facebook.